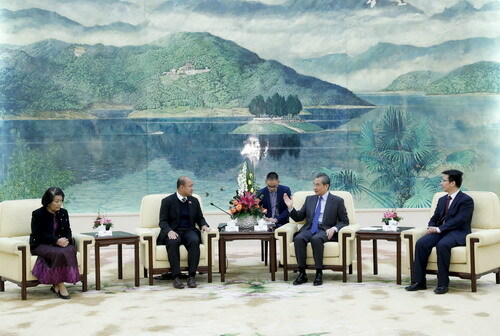 On December 6, 2018, State Councilor and Foreign Minister Wang Yi met with President of the Union of Youth Federations of Cambodia Hun Many at the Great Hall of the People. Wang Yi expressed that this year marks the 60th anniversary of the establishment of China-Cambodia diplomatic relations. The friendship between both countries has remained unshakable and become ever firmer as time goes by. Over the past 60 years, firstly, both sides have always respected each other and treated each other as equals; secondly, both sides have always supported each other and enjoyed high-level mutual trust; and thirdly, both sides have always enjoyed mutual benefit and win-win results as well as common development. Such precious experience is worthy of drawing on and carrying forward. The Chinese side firmly supports Cambodia in safeguarding its national sovereignty and independence and following a development path that is in line with its national conditions, and appreciates the Cambodian side for standing together with the Chinese side on issues concerning the Chinese side's core interests. The youth of both countries should carry on China-Cambodia friendship, enhance exchanges, learn from each other and pass on the baton of friendship, in a bid to usher in the next 60 years of China-Cambodia friendship. Hun Many noted that Cambodia and China are good neighbors, good partners, good friends and good brothers. As the younger generations, we stand ready to carry on Cambodia-China friendship established by the elder generations of leaders of both countries and strengthen exchanges and cooperation between the youth of the two countries, so as to make positive contributions to promoting Cambodia-China relations.